in days of peace and days of war"
1996 was a milestone year for many reasons. The American Federation of Musicians of the United States and Canada saw its 100th anniversary. The Royal Canadian Legion observed 70 years of dedicated service. EMD United Artists marked 25 years of representing performing artists in the music industry and The John Alphonse Big Band toasted 15 years of performing music from the big band era, one of the most memorable periods in the history of popular music. With so many achievements being realized at the same time, some felt it was only appropriate to develop a show which would recognize a common thread running through these accomplishments. In 1995 the John Alphonse Big Band performed three concerts in an attempt to gage the interest in music from the swing era. The evenings were fantastically successful and, from this assessment of audience reaction, a major tribute to a golden age in music was developed. Having performed for so many people who grew up on the music of Glenn Miller, Benny Goodman, Tommy Dorsey and others, the idea of a show with a theme that would appeal to veterans began to unfold. After five months of development, The John Alphonse Big Band, in association with EMD Artist Representation, is pleased to offer an evening in two programmes of nearly forty songs which recaptures the mood of the big band era. 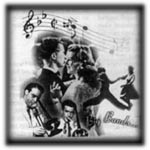 During their heyday - the period from the early 1930's to the end of the 1940's - groups of ten or more musicians were commonly known as "big bands". A typical band might consist of a leader, a rhythm section (piano, bass, guitar, drums), a woodwind section (three to five saxophones, some of them doubling on clarinet, bass clarinet or flute), a brass section (at least two trumpets and two trombones) and a singer or singing group, but many other combinations existed. Bands, or orchestras as they were called, appeared in ballrooms, hotels, nightclubs and theatres but attained their greatest renown as the result of thousands of remote radio broadcasts from hotels and ballrooms, as well as from a multitude of recordings. Big bands had existed since the 1920's but it was not until 1935, however, with Benny Goodman's engagement at the Palomar Ballroom in Los Angeles, that they started to become universally popular. Although it was seldom acknowledged, the success of the big bands was due in large part to the arrangements and orchestrations of the music. Benny Goodman owed much of his early success to the orchestral arrangements of Fletcher Henderson, Tommy Dorsey and Jimmie Lunceford. A number of big band leaders such as Duke Ellington, Glenn Miller and Les Brown used their own arrangements as well as those of others. Orchestra musicians, known as "sidemen", also occasionally doubled as arrangers. Henry Mancini and Nelson Riddle started their careers in this way. Also of vital importance to a band's success were its singers, many of whom went on to long solo careers in the entertainment business. Future stars like Frank Sinatra, Peggy Lee and Doris Day had their first popular success with the orchestras of Tommy Dorsey, Benny Goodman and Les Brown. With the advent of World War II, keeping bands together became more and more difficult as singers and sidemen entered the service. Wartime shortages of gasoline made touring across the country a difficult task. Slowly these combined factors helped to lessen the very importance of the big band and helped bring a close to one of the most significant eras in the history of modern popular music. Gone but not forgotten. The Royal Canadian Legion is an influential organization with a proud history. It grew out of small, scattered regimental associations and developed into a body comprised of more than 600,000 members in almost 2000 Canadian communities. At the conclusion of World War 1, many veterans' groups formed in Canada. The Great War Veterans Association, (GWVA) 1917-1926, was the one which grew to become the major voice to government on veterans' affairs in the years immediately following the Great War. It was the GWVA that advocated the unity of all servicemen's groups in Canada. At a national conference organized to take place in Winnipeg in November of 1925, the GWVA was successful in uniting many veteran's groups into the newly named Canadian Legion of the British Empire Service League to become based in Ottawa. For more than fifteen years The John Alphonse Big Band has been performing to audiences across Atlantic Canada. His orchestra is the premier exponent of the sounds that made the decade of the big band such an unforgettable era in the history of familiar popular music. From the melodies of Tommy Dorsey, Glenn Miller, Harry James and Benny Goodman to the wartime songs of Marion Hutton and Vera Lynn, all live on in an evening with the John Alphonse Big Band. The orchestra has performed for Canadian prime ministers and for British royalty. On different occasions Pierre Trudeau, John Turner, Prince Charles, Princess Diana, Prince Andrew and Prince Edward have all enjoyed music played by The John Alphonse Big Band. Other shows include annual performances at The Nova Scotia Lieutenant Governor's Ball, The Halifax Metro Centre's Seniors Expo, The Cystic Fibrosis New Year's Eve Charity Ball and The IWK Children's Hospital Annual Snowball. These dates and the countless national corporate conventions that have called upon them make it clear that The John Alphonse Big Band retains its position as the most sought after big band performing in eastern Canada. As an accomplished drummer and bandleader John Alphonse has amassed quite an enviable record. He spent seven years as the drummer with Rita MacNeil. He has accompanied Anne Murray, Mitch Miller, Pat Boone, Stan Rogers, Vera Lynn, Catherine McKinnon, The Irish Rovers, Peter Appleyard, Red Buttons, Dinah Christie, Patti Page and Dionne Warwick to name only a few. He has served as the regional Entertainment Director for the Jerry Lewis Muscular Dystrophy Labor Day Telethon and this year marks twelve in a row for John as the Entertainment Director for the Children's Miracle Network Telethon held in June of every year. Allan Moore was born in Dartmouth, Nova Scotia and started his career in music at a very early age. Allan and his brother Harold started performing as the "Harmony Twins" in 1926. The two brothers worked what was really the vaudeville circuit and kept busy in theatres throughout the province. When CHNS radio began in Halifax and was broadcasting from the old Carleton Hotel, the "Harmony Twins" sang on the very first show, the original "Pollyanna" radio programme. CHNS later moved to the rooftop of the Lord Nelson Hotel. A special penthouse studio was constructed to house the new radio facility. The "Harmony Twins" were invited to sing for the popular Uncle Mel and His Junior Radio Stars. The show was so successful that it led to the development of a radio series. The boys continued to perform live concerts and work on radio until 1940. The "Harmony Twins" entered the big band era singing with people like Kit Haggerty and Her Orchestra, the Harry Cochrane Orchestra and the Gerry Naugler Orchestra. The big band sound was as popular on Canada's east coast as it was in the rest of the country. In 1936 the CBC gave its very first coast to coast radio broadcast which was sent from the rooftop of the Nova Scotian Hotel in Halifax to Vancouver, British Columbia. Dual announcers were used for the occasion and the choice of J. Frank Willis and Ralph Marvin, who was brought in from Montreal for this one show, helped give the "Harmony Twins" a large national audience. The excitement of the times kept Harold and Allan very busy during the years which led to the outbreak of war. 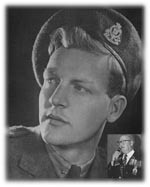 Allan entered the service in 1940 and he fought throughout Sicily, Italy, France, Belgium, Holland and Germany with the 1st Canadian Division. He joined the Legion some 45 years ago and as a member became involved with branch activities. He served in every office and eventually became president of Somme Branch No. 31. His other Legion duties include Zone Commander and Provincial Vice-President. He was elected to the Dominion Executive Council for 3 terms and has been appointed to numerous committees at the Dominion level. Allan has remained involved in the music industry all of his life. In 1950, he was contracted as vocalist with the Tommy Dorsey Orchestra when the big band undertook its concert tour of Eastern Canada. Today Allan is the featured vocalist with the John Alphonse Big Band and is the defining voice of great memories from a golden age. Wartime brings continued sacrifice on the homefront with shortages of meat, butter, coffee and shoes. The St. Louis Cardinals top the New York Yankees in the World Series. Katharine Hepburn and Spencer Tracey begin their long screen partnership. On July 4, 1942, Glenn Miller hits the charts with his version of "American Patrol". In 1939 Canada declares war on Germany. RCAF strength grew to 8287. 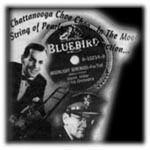 Glenn Miller has his 2nd million selling record which remains the #1 song for 12 straight weeks. Canada declares war on Japan. Jitterbugging is the nation's hottest dance. Mickey Rooney is Hollywood's top box office star and, in March of 1941, the Andrews Sisters have a best selling hit record. IBM introduces an electronic machine that works faster than any previous calculator. The first bikini swimsuit is modeled in Paris. Tommy Dorsey and the Andrews Sisters are on the charts at the same time in 1946 with this top 20 recording from Wayne King's hit 15 years earlier. With only 6000 TV sets owned in the United States, CBS and NBC begin regular television news broadcasts. The year's top animated movie is the Disney hit, "Dumbo". From the 1941 Abbott and Costello movie, "Buck Privates", the Andrews Sisters have a hit with a re-release of this 1920 Charles Harrison song. Canadian singer Harry MacDonough takes this song from the 1908 "Ziegfield Follies" and in April of 1909 it reaches #1 and stays there for 10 weeks. Ethel Waters and Kate Smith each bring back their own renditions in the early 1930's. Japan attacks Pearl Harbor. The World's largest dam, the Grand Coulee, opens in Washington State. On May 7 the British Royal Navy sinks the German battleship, "Bismarck". The first ever "gold record" status is awarded to Glenn Miller's phenomenal million selling #1 hit released in September of 1941. In May 1940, the British army is evacuated from Dunkirk. In the same month Glenn Miller releases a million seller named after the telephone number of the Cafe Rouge at New York's Hotel Pennsylvania. War rages in 1940 as Germany invades Denmark, Belgium, the Netherlands and France. From the London musical "New Faces", Glenn Miller, British bandleader Ray Noble, Sammy Kaye and Guy Lombardo all release versions of this song. The year is 1926. The Legion holds the first "Poppy Day" and popular Texas singer Gene Austin puts out this song in the month of March. Released again in 1940 by Tiny Hill and His Orchestra. Allied forces triumph in Sicily and Palermo. The war in North Africa ends with Allied victory. The Italian government declares war on Germany. Humphrey Bogart and Ingrid Bergman give a generation something to remember with the classic Casablanca, the Best Picture of 1943. Harry James and Muggsy Spanier both release versions of this song. Charles Lindbergh makes his famous 1927 solo flight across the Atlantic sighting Nova Scotia and Newfoundland along the way. Paul Whiteman, the most popular bandleader of the pre-swing era and Nick Lucas, easygoing vocalist/guitarist, each release versions of this melodic classic. In 1944 the Canadian government opens the Department of Veterans Affairs. It's the same year that Perry Como has a big hit with this famous wartime song. The year World War II started, Glenn Miller wrote this million seller that became his immortal theme song. Originally titled "Now I Lay Me Down To Weep". First put out by Bing Crosby on April 22, 1944, this song from the Broadway musical "Right This Way" hit #1 for a month. Although it was recorded in 1940, Tommy Dorsey released his version of the song in 1944 with the vocals being handled by a young singer named Frank Sinatra.